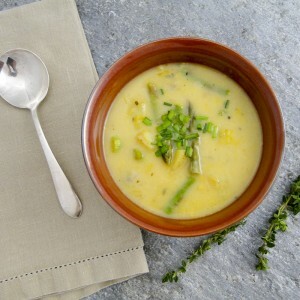 It worked for Harry Nilsson back in the 70's and it works for this butternut squash soup. Lime, coconut and a bunch of other ingredients give this butternut squash soup a Southeast Asian twist. The butternut squash is roasted to bring out its caramel flavors. Coconut milk adds a bit of mellow sweetness. A spoonful of pesto made from garlic, ginger, Thai fish sauce, lime zest, jalapenos, coconut and almonds provides contrast, zip and texture. This soup can be made ahead in various stages. You can roast the butternut squash a day ahead of time. You can make the pesto a day or two ahead of time. You can freeze the soup and thaw before serving. So there is a lot of flexibility. I make a double batch and freeze whatever is left over. While I classify this recipe as vegetarian and a Meatless Monday dish, I do use a splash of Thai fish sauce in the pesto. You can eliminate the Fish sauce or use a vegetarian Thai fish sauce to give your soup a little umami. I use real fish sauce and like Three Crab or Red Boat. A food processor will make quick work of chopping your onions, garlic and ginger and makes preparing the pesto a snap. 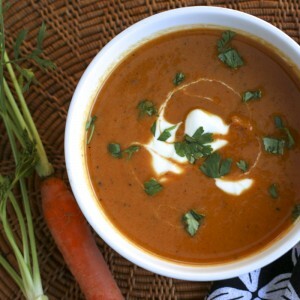 See my posts on butternut squash, how to peel ginger and how to make pureed soups. I like Aroy-D coconut milk because it is BPA free. A heavy Dutch oven is perfect for making this soup. 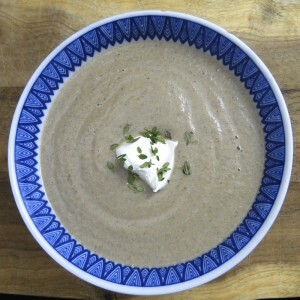 For the smoothest soup, use a blender to puree soup, but be sure to secure the blender lid, really hold it down tightly and gradually increase the blender speed from medium to high. Otherwise, you risk a mess and possibly a burn from blending the hot soup. Roasted butternut squash and coconut milk soup with a Southeast Asian twist is served with a dollop of cilantro, ginger, lime and coconut pesto. Heat oven to 400 degrees. Poke holes in the squash with a fork or a knife and roast until a fork easily pierces the squash, about 1 hour. Remove from oven and allow to cool. Peel the squash with your fingers, or use a paring knife to deal with the tougher spots. Slice squash in half and remove the seeds with a spoon. Chop into 2" chunks. While the squash is roasting, make the pesto. Put ginger in food processor and blitz until finely chopped. Remove ginger and set aside. Repeat with the garlic cloves. Return half the ginger and half the garlic to the food processor. Add cilantro, coconut, almonds, jalapeno, lime zest, lime juice, fish sauce, honey and salt to the food processor and blitz until mixture is finely chopped. Remove from food processor and set aside. Put onions in the food processor and pulse, until coarsely chopped. In a large heavy-bottomed pot, melt the butter. Add the onion, remaining garlic and ginger to the pot and sauté for 25 minutes, until onions are soft and begin to take on some color. Stir frequently. Add chicken broth, butternut squash and the orange zest strip to the pot. Turn up heat, bring to a boil and immediately reduce heat to medium. Simmer for about 15 minutes until squash is very tender. Turn off heat, remove orange zest and allow to cool. Working in batches, puree soup in a blender. Return soup to pot and stir in coconut milk and lime juice. Check temperature and heat up if needed. Serve in individual bowls or mugs with a dollop of the pesto. YUM!! Robust with flavour, go easy on the amount of pesto you add to your bowl of soup…..its packed with flavor! Hi Dining Diva, So glad you liked the butternut squash soup. You are right, the pesto packs a punch! I wasn’t so sure about this until I added the spicy pesto – makes the soup!! I say make the pesto extra spicy to add flavor! Hi, this soup looks super yummy! If making it to freeze for a soup exchange, would you put all of the pesto in the soup and blend and then freeze or leave the pesto out? Hi Cathy, no I would not put the pesto in the soup. Use it to garnish the soup. The contrast in colors and flavors is what makes it so good. Good luck! Hi Cathy, No I would not add the pesto to all of the soup. Use it to garnish the soup. 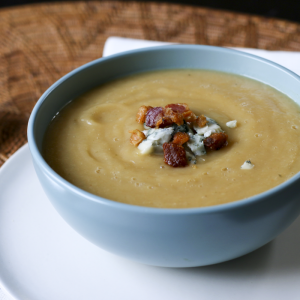 It is the contrast in flavors and colors that makes this soup so good. Good luck!